Seemingly stalled on health care and Medicaid, congressional Republicans and the Trump administration will soon turn their attention to taxes—another area in which federal reform offers mixed prospects for New York State. On the one hand, a well-designed federal tax cut could significantly boost the nation’s economy and help residents of all regions. On the other hand, Trump’s initial proposals would also discriminate against New York and a handful of other high-tax states in one crucial respect, resulting in smaller net cuts for their taxpayers. Last week certainly was as good a time as any for Comptroller Thomas DiNapoli to frame the issue with a “What’s At Stake for New Yorkers” report. The comptroller’s first-blush analysis focused heavily on how the Trump proposal could affect New York’s (mainly downstate) six-figure middle class—but virtually ignored the plan’s broader implications for the state’s finances and economic competitiveness. For New York, the obvious crux of the plan first broadly outlined by the Trump White House in April is the proposed repeal of federal itemized deductions for state and local tax (SALT) payments. As of 2014, New Yorkers claimed $68 billion in state and local tax deductions, according to Internal Revenue Service (IRS) statistics. Only Californians claimed more. The average SALT deduction claimed by New York itemizers was highest in the country at $21,038, nearly double the national average of $11,846. This is not the first time the deduction has been threatened: there was a serious, bipartisan push to eliminate SALT breaks during the “Showdown at Gucci Gulch” leading up to the Reagan era federal tax reform of 1986. The deduction for state and local income and property taxes survived after an intense lobbying effort largely fueled by business groups from New York and other affected states, at a time when New York had significantly more clout in both parties and both houses of Congress. But DiNapoli’s emphasis on the middle-class “hurt” angle was somewhat overblown and misleading. Yes, New Yorkers in general are more likely to claim itemized deductions—and, yes, downstaters by far have the most to lose from repeal of the SALT deduction in isolation. However, as explained below, even if the SALT tax break is repealed, most middle-class New Yorkers are still likely to realize at least some net federal tax cut under other provisions of the plan outlined by Trump. From a New York perspective, the most objectionable feature of the Trump plan is not that our middle class households will be “hurt” (in the sense of paying higher taxes in the end) but that they will pocket smaller federal tax savings than people with the same incomes who live in low-tax states. As for the wealthiest taxpayers, the prospects for a true “windfall” hinge on aspects of Trump’s plan that now rate as considerably less than “distinct possibilities.” If anything, the biggest savings for the high-income households are far less likely to actually materialize than proposals that would benefit the middle class. A far more “distinct” possibility is a federal tax reform that leaves New York’s wealthiest households with small net tax cuts—or, in some cases, even a tax hike. 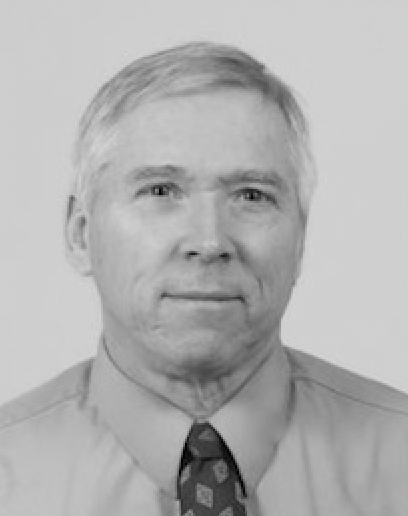 Although the comptroller plays an important role in monitoring state finances, his report virtually ignores the real fiscal threat this represents for Albany. If the SALT deduction is eliminated, New York State’s net income tax rate for high-income households—the state tax bite after allowing for the federal tax deduction—will rise to its highest level ever, as shown below. 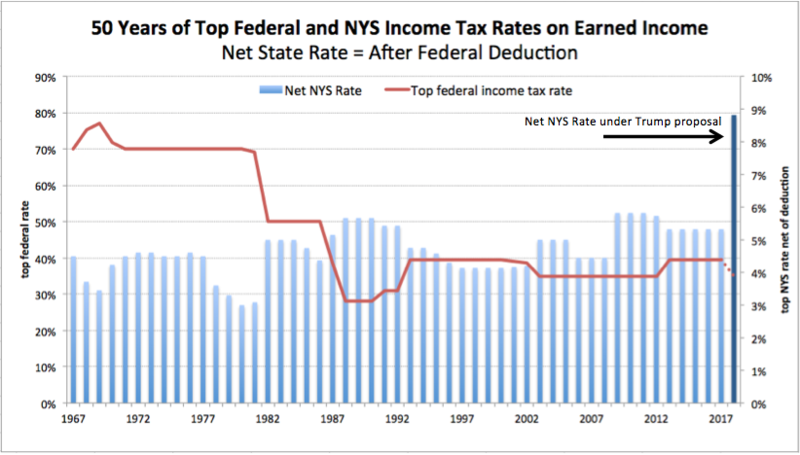 Although New York State’s income tax rate rose to double-digit levels in the 1960s and ’70s, the net state rate on earned income (wages, salaries, bonuses) after full federal deductibility (not counting the on-again, off-again PEP and Pease limitations) has ranged within a fairly narrow band amid reductions and fluctuations in federal rates over the past 50 years. The net state rate previously peaked at 5.8 percent between 2009 and 2012, and now stands at 5.3 percent. But if the SALT deduction disappears, New York rate would shoot up to its full current statutory level of 8.82 percent, as shown above. To look at it another way: under current law, New York State accounts for 11 percent of the combined federal-state tax bite on earned income of multi-million-dollar earners living here. Under Trump’s plan, New York State’s share would rise to one-fifth of their total tax bill. In other words, these high-income earners could cut their tax bills another 20 percent by moving to Florida. To the extent they depend on long-term capital gains income, which already is subject to a lower federal rate, the potential savings will be even larger. And the effect will be even more pronounced for residents of New York City, where the combined state and city top rate is 12.7 percent. A record high net state rate in New York would give the state’s high-income earners a bigger incentive to move to lower-taxed jurisdictions, accelerating an already noticeable trend. Because New York is so heavily dependent on the highest-earning 1 percent of its taxpayers, this could seriously erode state revenues in the long run. The ripple effects ultimately will affect far more New York middle-class taxpayers and working families than will be directly affected by repeal of the SALT deduction. Federal rates will be cut. There are now seven brackets: 10 percent, 15 percent, 25 percent, 28 percent, 33 percent, 35 percent and 39.6 percent. Mnuchin indicated they’d be reduced to three: 10 percent, 25 percent and 35 percent. Depending on the income cutoff points, that could equate to big tax savings for middle-income payers, in particular. The federal standard deduction would be doubled. The standard deduction now ranges from $6,350 for single filers to $12,700 for married-joint filers. It would be raised to $12,700 and $25,400, respectively (higher, actually, after indexing for inflation in the meantime). The Alternative Minimum Tax (AMT) would be repealed. New York is home to 483,900 AMT filers, second only to California. Their AMT comes to an average of $9,081. The AMT—under which state and local tax deductions are already disallowed—originated in the late 1960s as a way to prevent the very rich from avoiding taxes, but over the past 20 years has become a tax that applies mainly to an affluent band of low- to mid-six-figure households. Roughly 22 percent of New York’s AMT filers earned $100,000 and $200,000; the lion’s share of the rest earned between $200,000 and $500,000. The comptroller’s report focuses on the fact that New Yorkers have higher average itemized deductions, mainly because those deductions include higher average state and local taxes. On a statewide basis, taxpayers earning less than $100,000 claim average deductions just above $20,000, well below the $25,200 proposed standard deduction. For those in the $100,000 to $200,000 bracket, the average itemized deduction is just above $27,000. Unsurprisingly, average itemized deductions are much higher at higher income levels—averaging $688,805 in the $1 million-and-up bracket. In general, average itemized deductions are much higher in all income brackets downstate. But, as noted, the deduction is only one of several significant changes in the Trump outline. The reduction in the number of tax brackets also will have a significant bearing on taxes paid by middle-class families. Most downstate homeowners have income placing them in the 25 percent marginal bracket, which covers taxable incomes (net of deductions) between $75,900 and $153,100 for married-joint filers. To illustrate, imagine a not-untypical Long Island couple—call them Mr. and Mrs. Smith—with adjusted gross income of $160,000 and itemized deductions of $32,000. Trump’s change in deductions alone would raise the Smiths’ federal tax by $1,650 (i.e., 25 percent of the $6,600 difference between $32,000 and the proposed higher standard deduction). However, as noted, Trump is also proposing to collapse seven federal income tax brackets into three. With the 15 percent bracket slated to disappear, if the top of the current 10 percent bracket is extended all the way to the bottom of the 25 percent bracket, the Smiths will still manage to save about $1,000. That’s because a big chunk of the first $75,900 of their income will be taxed at a rate that is one-third lower, cutting their tax bill by $2,862 before deducting the net cost of the SALT repeal. Because details of Trump’s plan are so sketchy, it’s unclear where the tax bracket thresholds will be set. But to deliver on their widely touted promise of a tax cut for the middle class, Trump and congressional Republicans will need to peg the new bracket thresholds at income ranges that drive bigger savings for the same segment of New York’s six-figure middle class that has the most to lose in a SALT deduction repeal. And as DiNapoli’s report acknowledged in passing, additional savings will be generated for the sizable number of New York households, mainly in the $200,000 to $500,000 range, who are now subject to the AMT, which Trump and Congress want to repeal. New York’s wealthiest taxpayers would stand to gain from two elements of Trump’s tax program, in particular. First, Trump has proposed slashing the corporate tax rate from its current 35 percent to 15 percent — and would extend this 15 percent rate to the income of “pass-through” entities such as partnerships and Subchapter S firms, whose net profits are now subject to their owners’ individual income tax rates. While nearly all small and closely held businesses would benefit, the preponderance of wealthy taxpayers reliant on business income would save by far the most from what amounts to a 62 percent cut in their current marginal tax rate. This also would provide many more taxpayers with an incentive to effectively incorporate themselves. One potential fix under consideration: a tax increase for individuals who file as pass-throughs so they pay tax on par with personal-income tax rates. Another fix would impose a second layer of taxes on individuals who do so. Under that scenario, the taxpayer would preserve the 15 percent business-tax rate, but then be subjected to an additional rate, probably 20 percent, on the remaining income. The total tax bill would be the same as the proposed top personal income tax rate. The highest-income payers also would benefit disproportionately from a Trump-supported proposal to eliminate the additional 3.8 percent tax on capital gains and dividends, which was enacted in 2013 to help fund President Barack Obama’s Affordable Care Act. This tax is now targeted at individuals with incomes starting at $200,000 and couples with incomes at $250,000. Assuming (as now seems most likely) that neither of the largest Trump-supported tax cuts for the wealthy actually materialize, top-bracket taxpayers would still be left with rate reductions of at least 4.6 percentage points, from 39.6 percent to 35 percent. This is nothing to sneeze at, obviously—but for New Yorkers, the net savings from the rate decrease will be substantially reduced by the loss of a sizable state and local tax deduction. Indeed, as explained in this space a few months ago, some New York City households with multi-million-dollar incomes could end up paying a higher combined federal-state-local income tax bill under the Trump plan. As noted, New York’s base can be significantly eroded if even a small number of very high-income households respond by shifting their main residence to lower-taxed states. Federal tax reform could erode NY state tax base, economic competitiveness.
.@NYSComptroller fed tax reform analysis focuses on NY's 6-figure middle class; broader implications more important.